Cats make great companions for people of all ages and walks of life. Whether you are a busy single professional living alone in a small apartment in the city, a family with children living in a house in the suburbs or a senior citizen living in a retirement home, a cat can be your ideal pet. Although dogs can also make great pets for some seniors and provide the same benefits as cat ownership, careful consideration should be given to the care, training and exercise requirements of a dog. Many older owners simply can’t keep up with a dog’s needs, which makes adopting a cat a much better choice. Unlike dogs, cats are happy staying indoors all the time. Most adult cats require only 20 to 30 minutes of playtime per day, and interactive play does not require the owner to be mobile. A kitty fishing pole or laser toy lets senior cat owners engage their cat in play while sitting in their favorite chair. Cats are also very content to spend most of their time sleeping on their owner’s lap or bed. Before acquiring any pet, it is important to consider the lifespan of the animal and what will happen in the event that the owner is no longer able to care for the pet. In many cases, seniors need to move into a living facility that does not allow pets, or the pet outlives them. Both dogs and cats can live 15 to 20 years, so it is important that seniors have a younger friend or family member who is willing to take responsibility for the pet if necessary. Many people think that getting a kitten or puppy for a senior will help “keep them young,” when in reality, puppies and kittens often provide seniors with more stress than enjoyment. Choosing to adopt an adult cat or dog is generally a wise choice for seniors. Adult animals have fewer exercise and training demands, making them easier for seniors to keep up with. Additionally, older pets are also less likely to outlive their senior owner. Arrange to visit your local animal shelter to view the cats available for adoption. Talk to the staff and ask for a calm, easygoing, adult lap cat with minimal medical requirements. The last thing a senior wants is an antisocial cat or one who is prone to urinary tract infections! 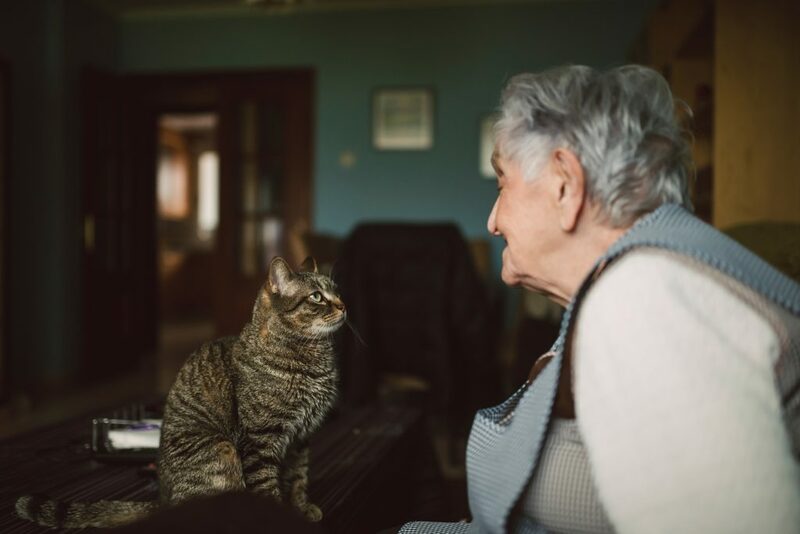 Once your senior loved one decides on a cat — or two! – you can help shop for pet supplies (including a collar and ID tag) and set everything up in a convenient location for both owner and kitty. Once you help the senior in your life get a feline companion, be sure to provide follow-up care and support. Some seniors are not able to get to the store for needed supplies, while others are dealing with health or behavior problems with the cat and don’t know what to do. Be sure to check in with your loved one and their kitty to make sure things are going well. If you know of a senior who is having difficulty affording veterinary care or food for a pet, be sure to contact your local animal shelter, food bank or veterinary clinic. Most professionals in the animal field understand how important pets are to seniors, so they may offer low-cost services and supplies just for seniors. 1 Veterinary Pet Insurance (2010). Pets and Senior Citizens. Obtained 4/10/2010.